It was a big storm a couple of days ago; with wild wind. The next day I surveyed the damage in the backyard. Several of my prized pine cones from the Queensland Kauri Pine tree were lying on the ground. Whilst holding one of the cones and contemplating what size it might have become, I felt a tugging at my trousers and looked down and was surprised to find a Pikachu Pokemon; they are still in the area. They're tough critters and being somewhat annoyed, I considered dropping the heavy pine cone on Pikachu. I spent late afternoon at the Capri Theatre @ Goodwood. I thought that I was going to see Star Wars, but it was Red Dog (rating 3/5). When emerging onto Goodwood Road @ 6pm all was quiet, no cars; just lots of Police and SES vehicles. A burst water main opposite Goodwood Library had shut down the street. David Pisoni MP, Shadow Minister for Burst Water Pipes was there watching the gusher. Minister Ian Hunter had been there; getting his cardboard legs wet in the torrent. I spoke to a local resident and expressed my opinion that the Government should replace the water mains pipes before that strip of Goodwood Road is resurfaced in 6 months. It just makes sense; plain common sense. To fix the ageing water pipe infrastructure, the Government must invest say $50m a year over 30 years to reduce the number of burst mains. Ageing infrastructure must be replaced along entire streets rather than ad hoc repairs. Last Christmas I blog boasted about my stuffing for the chicken. It was the best ever, until this year. Here's a link to my blog in 2015. Last year the stuffing earnt a Gold Medal; awarded by the family. This year I was awarded a Trophy (and 3 Golds). What made it just that bit more special? I'm so excited about the Trophy. Enjoy the closing days of 2016. It was a huge night of protest at last night's public meeting to receive submissions on the Unley Central Precinct Development Plan Amendment (DPA). 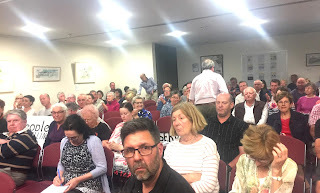 There were in excess of 100 residents and most expressed their opposition to the proposed DPA that would allow medium to high- rise development in central Unley. In particular, there was absolute opposition to high-rise development at the Civic Centre; development that would tower over the Town Hall, Library and Church. There were strong sentiments of 'make this an election issue'. As the night progressed the opposition became more vocal. Even Mayor Lachlan Clyne joined in; by giving a lengthy lecture to the protestors on the merit of the proposal and the process. That didn't, shall we say, go down very well. I remain opposed to the high-rise development at the Civic Centre. That can only happen if the draft DPA is approved by Council and sent to the Minister for Planning. Remember the story about the 11 streets up on the Sunshine Coast (Qld) that had wonderfully beautiful and bountiful street gardens; where fresh fruit and vegetables were shared by the community. Now the local Council has stepped in and got bureaucratic. Council insists that residents get permits and $20m public liability insurance. This doesn't happen in Unley where there is a growing number of fruit trees on the street and garden verges are encouraged. The food trucks are coming in huge numbers to Goodwood. Starting next year the initiative (known as the Food Truck Movement) will see dozens of food trucks setup inside Goydner Plaza (at the Showground) on Thursday to Sunday, 11am to midnight. This will be a weekly event. A liquor licence will help to lure people to consume the burgers. Goydner Plaza holds 800 people so it will be huge. The plan is to have live music or family-themed days with children’s activities. No Council permit or licence is required. It will be great to pop in late at night for that burger or other food truck delight on the way home from a big night out; at a time when other food joints are closed. This initiative has happened due to the State Government recently declaring that there be no limit to food trucks.